A small spherical object made with the 94 naturally occurring elements on Earth. It measures 1 inch in diameter. 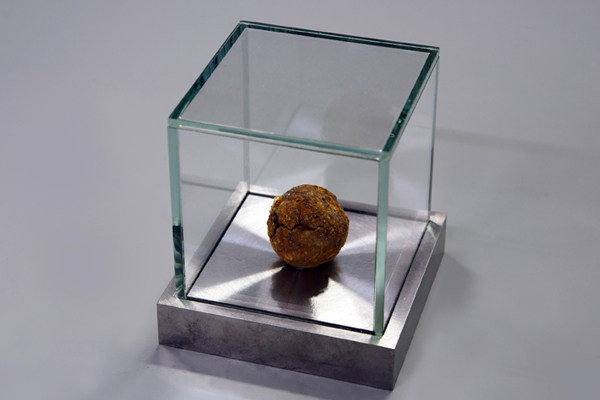 Terrestrial Ball is a small, spherical object made of the 94 elements that occur naturally on earth. It is at once a tangible look at the world we live in, a memento of our home and an object that relates in an elementary way to every other object and substance that has ever been made. Meteors – bits of other worlds that fall onto ours – are regularly found on earth. Perhaps this earth ball will itself someday be found, informing others of our existence. Born in Liverpool in 1982, Kianoosh Motallebi makes objects and installations that use science and scientific principles as a context for exploring art and existentialist questions about human existence. His works often define a larger context inhabited by both the viewer and the work. This larger context creates a space for challenging and exploring the interconnections between humans’ everyday experience of their surroundings and the physical laws that govern them. Kianoosh Motallebi is born in Liverpool in 1982. He completed his Masters in Arts at the Slade School of fine Art in London. He currently lives in Amsterdam where he has recently finished a two year residency at the Rijksakademie van Beelden Kunsten. He has participated in “The Physical Centre” (Guest projects, London, presented by Yinka Shonibare), “Erased Walls” (Berlin), and the RijksakademieOpen 2011, Van der Mieden Gallery (Antwerp), DEAF2012 (Rotterdam), Schauort (Zurich), Residency at Very Real Time (Cape Town).